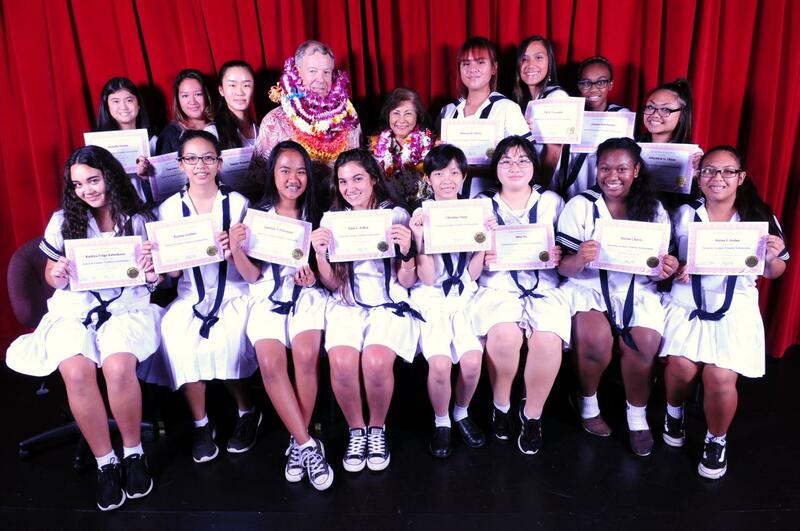 More than 98 high school students received scholarships at Sacred Hearts Academy’s annual Scholarship Award Ceremony last week. Students are granted scholarships based on financial need, as well as meeting specific criteria determined by each scholarship. According to the school, donors are those who believe in the Academy’s mission to offer an outstanding education to the young women of the 21st century. “Getting a scholarship was really a blessing, and knowing I have standards to uphold, motivates me to do my best in school,” said sophomore Xavier Downey-Silva, who received the PWH Foundation & Augustine Educational Foundation Scholarship. The event served as an opportunity for scholarship recipients to thank their donors and respective organizations. Commencing with a speech by Head of School Betty White and a performance by the school’s Glee Club, the event of about 300 attendees began on a spirited note. The scholarship awardees were then called to the stage to give a lei to a representative of their respective scholarship organizations. Some of the organizations that donated included Arcadia Foundation, Bank of Hawaii and Bow Engineering. Scholarships were also made possible by the previous classes of 1946, 1952 and 2003. The students receiving scholarships expressed their gratitude to their donors, as they gathered in the gazebo area for light refreshments after the program. “We hope that the students realize that there are a lot of people who believe in the outstanding education and values that Sacred Hearts Academy instills in its students,” said Director of Almunae Affairs Tiffany Kiyabu Nishimura. Kiyabu Nishimura, along with Director of Student Activities Cleo Eubanks, were the emcees of the event.